If you're looking to whittle down your energy bill this year, start in your living room. An unsealed fireplace invites the winter chill inside while heated indoor air escapes. We'll show you how to make this beautiful barrier—and leave drafts out in the cold. As temperatures dip, nothing feels better than thick fleece socks and a seat next to the fire. But, between uses, an empty and open fireplace lets cold air sneak in through the chimney (not to mention comes across as a bit of an eyesore). Sure, you can turn up your thermostat to counteract the chill, but that will send your heating bill through the roof—along with the heated air that continues to be displaced. But as Instructables maker mikeasaurus demonstrates, there is a third option: shutting out the cold with a few fallen branches and some simple scrap wood. Mike’s lookalike log insert eliminates costly drafts year-round while serving as a sneaky cover-up for a fixture that’s hard to keep soot-free and spotless. Though this insert appears to be three-dimensional and about as deep as the fireplace, the draft stopper for mikeasaurus’ humble hearth is less than 4 inches thick, and only amounts to three large branches in total. 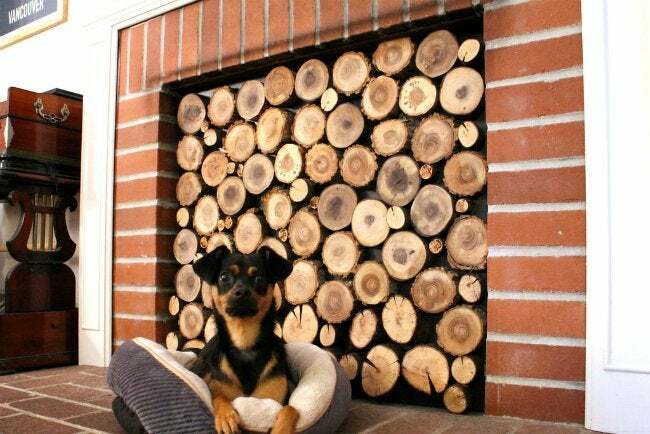 To maximize the wood collected from the yard, he cut each into 2- to 3-inch-thick rounds using a bandsaw. Sanded and stained in richer tones, the branches take on the look of freshly chopped logs. From here, he puzzle-pieced and glued the wood rounds onto a painted-black plywood sheet cut to the exact dimensions of his fireplace opening. Its snug fit ensures that this DIY draft stopper stands in the fireplace and effectively plugs any potential air leaks. 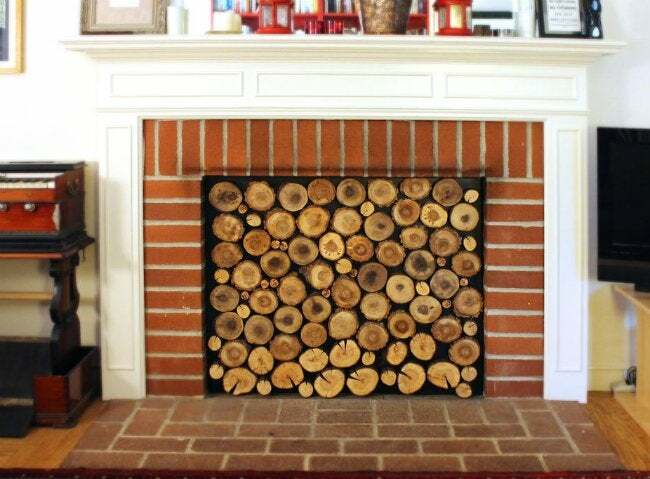 Once it’s dry and gently lodged in place, the living space gains a stunning new faux focal point that prevents hard-earned heating dollars from going up in smoke. And when you’re ready to warm up again, it’s easy to reverse this fix: Simply pull out the insert, replace the fireplace’s screen, and rekindle the flames.